Some of us old timers have resisted cell phone cameras for real photography, but the time has come to give in and embrace all the benefits that are offered by cell phone cameras. While I still use my “real” camera for my serious photography, I have turned to my iPhone for a lot of what I do. I use it for all my video work, for behind-the-scenes shots, and just casual shooting when I am out without my camera. I have turned to a few different tools to help improve my iPhone's capabilities. I recently wrote about how I used the Pictar to help gain more control over the camera settings, and now I am using the Grip & Shoot to shoot better videos, make shooting easier, and gain the ability to shoot remotely and on a tripod. I first discovered the Grip & Shoot at the last WPPI Exposition in Las Vegas. 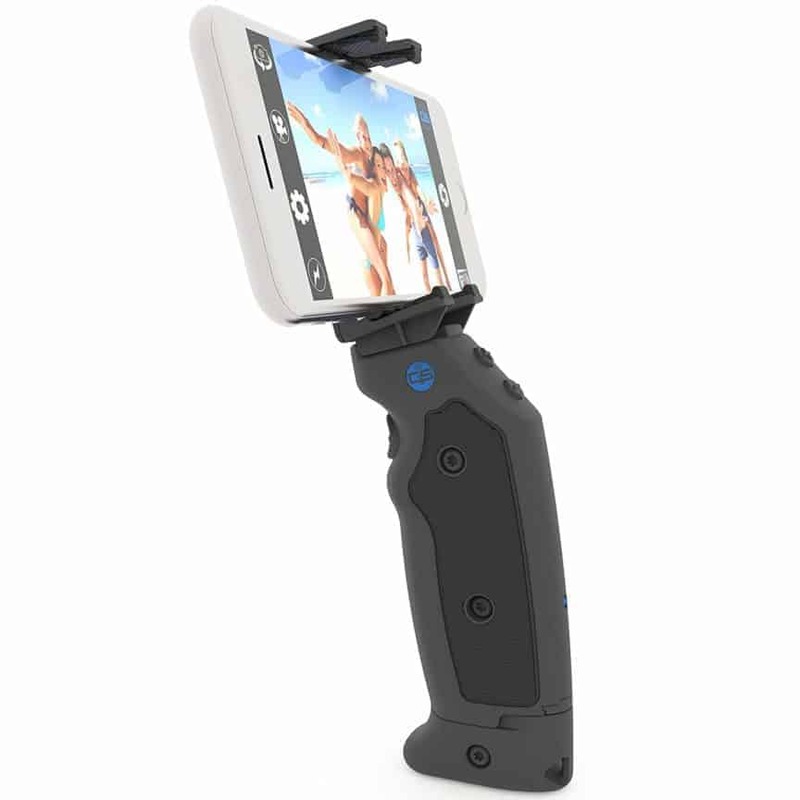 As I had been using my phone more often, especially for video, I was intrigued by how the Grip & Shoot might help me. The Grip & Shoot looks like a very simple tool, but it offers a surprising amount of capability. It has two parts. The first part is a grip that almost looks like a pistol grip that you hold in your hand. The grip has a trigger (right where it would be on a pistol) that controls the shutter. The grip also has “+” and a “-” buttons on the back of the grip where your thumb can press them. These buttons control the zoom on your phone camera. The second part of the Grip & Shoot is the tripod stand. The tripod stand flips up and adjusts to hold any phone up to 3.5″ wide. The tripod stand slides in and out of the pistol grip so you can shoot with your phone on your grip or you can place the phone on a tripod or any other surface and use the grip as a remote trigger. The remote can trigger from up to 100 feet away, and the tripod stand has a standard tripod thread that easily screws into your tripod. What I really love about the Grip & Shoot is how easy and convenient it is to use. The Grip & Shoot folds up to 5.7 inches and weighs only four ounces. It is really easy to throw in your pocket or any bag so you can pull it out whenever you want to use it. The phone easily slides onto the tripod grip which can be attached or detached from the grip really easily. Once you get the phone in the Grip & Shoot, you just open the app and start using. While it is annoying to have to open an app to use the camera on some devices, this one loads up quickly and is no different than opening the camera app on your phone. Once you are in the app, you gain some extra control over your camera settings as well. You can do this on the touch screen or you can program them into the Grip & Shoot so you can adjust zoom, video modes, crop size, exposure settings and other functions from your grip and even adjust them remotely while your tripod grip (and phone) are separate from the grip. Another huge benefit of the Grip & Shoot doesn't seem to wear the phone battery down any more quickly than just normal use of the camera. Some other photography apps and devices I have used seem to drain the battery so fast you can actually see the numbers going down as you look at the phone. The other big benefit to using the Grip & Shoot is that it stabilizes your video. True, it is not going to give you the all the benefits of a more expensive electronic gimbal stabilizer, but at the lower price and with all the added benefits you get as opposed to just a gimbal stabilizer, I feel much more comfortable spending the money on the Grip & Shoot. While I have loved using the Grip & Shoot, I am so much more excited for the Grip & Shoot Cage that is supposed to be available in the fall (2018) and I can't wait to get one for video use. The Grip & Shoot Cage is a small aluminum frame that holds your phone in the center. One side of the cage is the Grip from the Grip & Shoot. 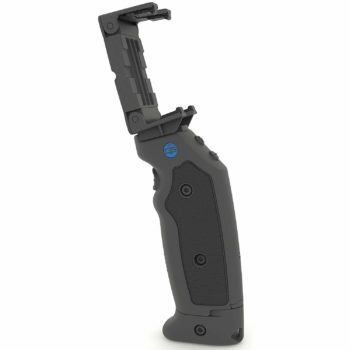 This gives you the pistol grip for easy grip, but also allows you to take advantage of the remote system so you can still use the cage remotely, which is awesome for anyone that shoots vlogs or tutorials. The big benefits added with the Grip & Shoot Cage are that you can add a ton of useful video accessories on the cage. The most important of which is the 3 cold shoe mounts where you can hook up an external microphone, a flash and other things that use a shoe mount. The microphone ability is huge as the sound quality can really set apart a good video. If you are trying to make money with your videos, you have to have excellent sound quality. The only way to get that is with a good external microphone. You can also shoot more creatively by adding different lenses to the 37 mm lens attachment. For more advanced videographers, the ability to add different cinematographic shooting styles is a must. 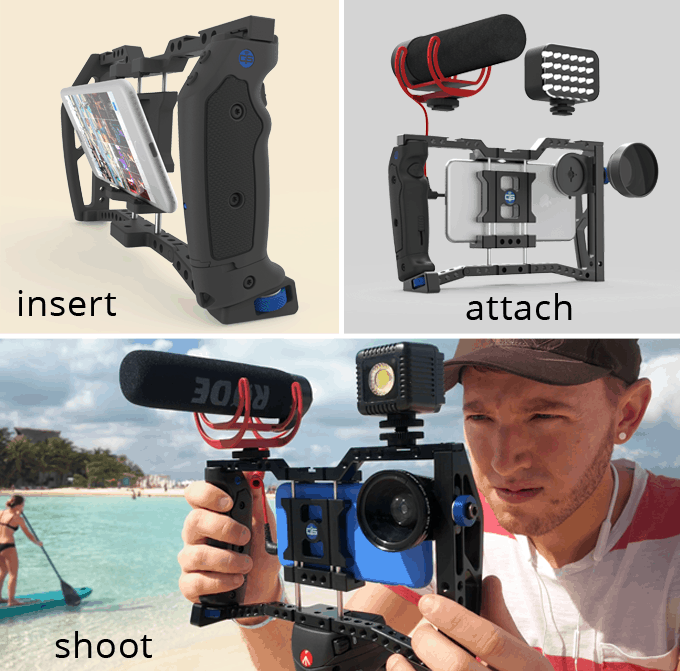 Having the ability to attach different lenses to your phone quickly and easily, all while having your microphone, flash and other accessories on the cage is just awesome. The Grip & Shoot has been a game changer for me as I try to incorporate my iPhone more into my shooting, especially with video. I honestly have always hated trying to use my cell phone camera for anything more than snapshots of my kids, but that has changed with thegrip a Grip & Shoot. I have especially loved using the Grip & Shoot to make videos as it is so much more stable than trying to handhold the phone. I also love being able to use the remote to take family shots on vacation and to record videos where I am talking to the camera or want the ability to trigger remotely to capture action. I see the Grip & Shoot as solving so many problems faced by professional photographers, especially those that shoot vlogs or do tutorials. While I wouldn't normally say that about something for a cell phone camera, the ever-increasing capabilities of cell phone cameras, especially for video, make it true with the Grip & Shoot. 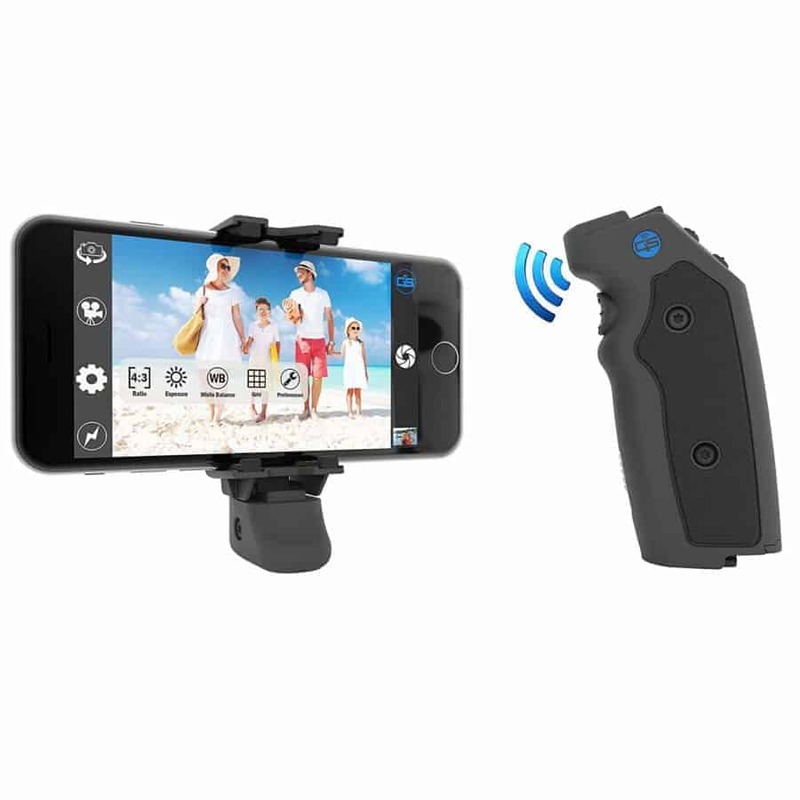 The Grip & Shoot is available for under $100 on Amazon.